Although outlawed in many states, serpent handling remains an active religious practice—and one that is far more stereotyped than understood. 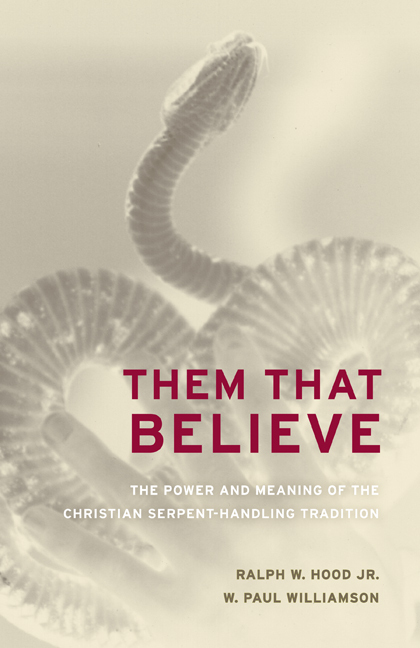 Ralph W. Hood, Jr. and W. Paul Williamson have spent fifteen years touring serpent-handling churches in Alabama, Georgia, Tennessee, Kentucky, North Carolina, and West Virginia, conducting scores of interviews with serpent handlers, and witnessing hundreds of serpent-handling services. In this illuminating book they present the most in-depth, comprehensive study of serpent handling to date. Them That Believe not only explores facets of this religious practice—including handling, preaching, and the near-death experiences of individuals who were bitten but survived—but also provides a rich analysis of this phenomenon from historical, social, religious, and psychological perspectives. Ralph W. Hood, Jr. is Professor of Psychology at the University of Tennessee at Chattanooga. W. Paul Williamson is Associate Professor of Psychology at Henderson State University. Hood and Williamson are coauthors, with Peter C. Hill, of The Psychology of Religious Fundamentalism. 1. "They Shall Take up Serpents"